Abu Dhabi: UAE made life difficult for themselves as they squandered the lead twice before beating Kyrgyzstan 3-2 in extra-time to enter the quarter-finals of the AFC Asian Cup at the Zayed Sport City Stadium on Monday. At half-time, the teams were tied 1-1 and at full-time it was 2-2. For UAE, Khamis Esmaeel, Ali Mabkhout and Ahmad Khalil (penalty extra-time) scored a goal apiece while Mirlan Murzaev and Tursunali Rustamov scored for Kyrgyzstan. UAE will now meet Australia, who defeated Uzbekistan 4-2 in penalties after being locked 0-0 in full and extra time in the contest played in Al Ain earlier in the evening. 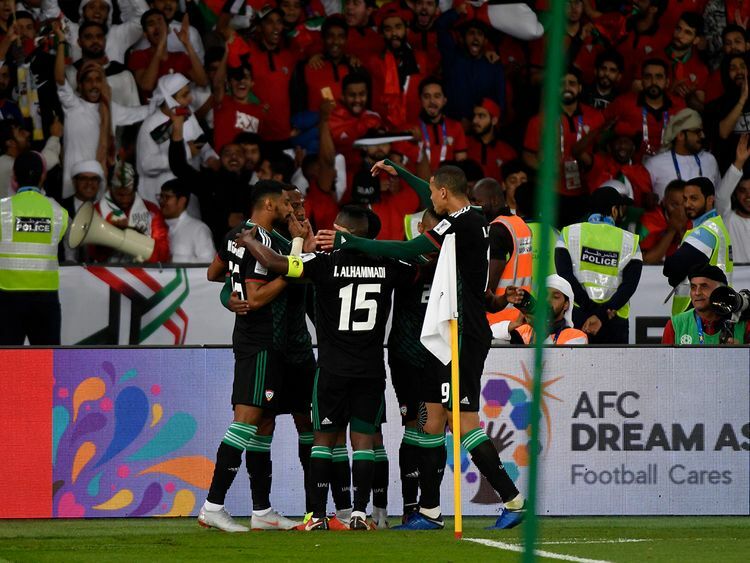 UAE, playing in a black and green outfit for the first time in the tournament, started off with their mercurial veteran striker Esmail Matar, who had so far come on only towards the end when the contest was almost done and dusted. And Matar didn’t disappoint as UAE shot into the lead in the 14th minute from his brilliantly taken corner. His cross was first nodded from the centre of the box by Khalifa Mubarak and Esmaeel, left unmarked at the far post, slotted it home with another header. However, the lead didn’t last long as Kyrgyzstan drew level through Murzaev. The striker timed his run to perfection after being set free by Akhlidin Israilov before side-stepping a rooted UAE goalkeeper Khalid Eisa and finding the goal with a fine placement. Soon after the change of ends, Mabkhout sent a straight forward header wide off a measured cross from Bandar Al Ahbabi. Mabkhout, however, was on target in the 64th minute. He beat an offside trap and controlled a measured lob from Amer Abdul Rahman before finding the left-bottom corner of the goal. Mabkhout has now scored eight goals in 10 AFC Asian Cup games for UAE since the start of the 2015 tournament. UAE went into their shell after that goal and paid the price in injury-time. A Rustamov header from very close range went into the bottom right corner following a corner from Anton Zemlianukhin and the scores were level at 2-2. Then it needed Khalil, who came on as a substitute in extra-time, to restore the lead through a penalty drawn by Mabkhout in the 103rd minute. In the last minute of second half of extra-time, the framework also came to the rescue of the hosts.